Hey Ladies! 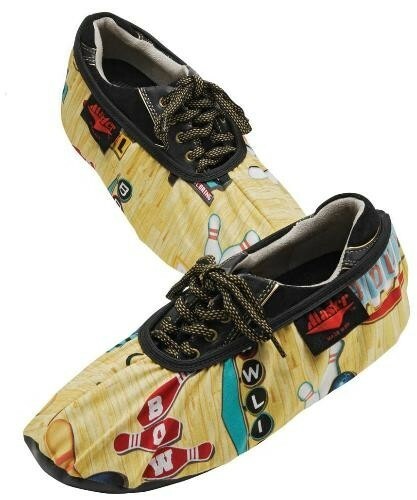 Check out these Master Shoe Covers with a bowling pin design! They slip on easily over your bowling shoes and they have a special interior lining to prevent the fabric from tearing. The Master shoe covers I origianlly purchased were to fit up to a size 9(s/m). This was not to be true.I wear a size 8 half and the covers were considerably too small. I had to return them to get a large. which were none to big.I think you should change the sizing allotments on the description of the product. I live these because I Love butterflys! They feel like they will be durable! They go on and off easily! Goes over the shoe easily and the multi-colored is great especially when you forget to take them off and proceed to bowl, the color stands out and thus no accidents. Thanks, I love them! I would not buy these again! My previous comment was in error! These shoe covers were at least a whole shoe size too small. Due to the time it takes to produce the Master Ladies Shoe Covers Pins ball it will ship in immediately. We cannot ship this ball outside the United States.